A Japanese Nightingale is in Mark Twain's library; a page no longer available at the Mark Twain house site indicated that this is one of the last books that Livy (his wife) read. 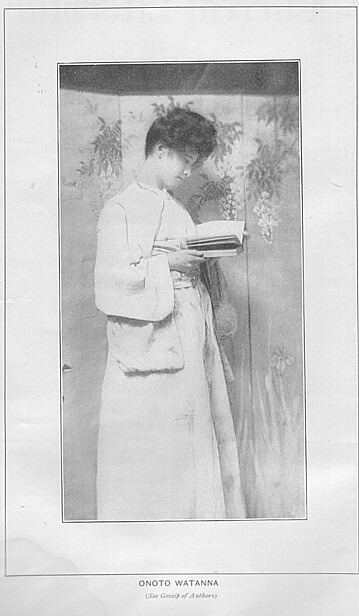 Unusual and very interesting has been the career of Onota [sic] Watanna, who in private is Mrs. B. W. Babcock. For one so young--she is but twenty-three--she has been more of a wanderer, and has seen more of the world than the usual person of twice her years. As is generally known, she is half Japanese, her father being an Englishman in the consular service, and her mother a full-blooded Japanese. Her parents were married according to the rites of the Christian church and are both still living. Onota Watanna was born in Japan, but was educated here and in England. She entered literature, as have many others, through the door of journalism. WHen but fifteen years of age she reported the debates of the letgislative council in Jamaica, West Indies, for a small local newspaper. She then came to this country and did work for the Cincinnati Commercial-Tribune. Her first Japanese story was published by that paper. She left Cincinnati and went to Chicago, and for four years wrote for papers and magazines. Her first magazine story came out in the Ladies' Home Journal; since then she has written for nearly all the large periodicals of the country. While in Chicago, she wrote her first book, Miss Numé of Japan. She has lived in New York but two years, during which time she has worked for Munsey's and has studied at Columbia University. Her beautiful story, A Japanese Nightingale, which came out last year, is of course her most important piece of work and her finest. It was this story which established her claim and suggested something of the strength and power and poetry which she possesses. THe book was really an achievement for one so young, and a vague analogy between it and her life, which the curious might care to draw, gives it additional interest.